This is a hand-held, battery-operated, electro-stimulation medical device. 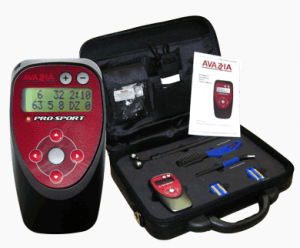 The Avazzia PRO-SPORT Ultra is an Avazzia Reactions device with pre-set modes and five variable modes. Caution: U.S. Federal law restricts this device to sale by or on the order of a physician or healthcare practitioner. INTENDED USE: Transcutaneous Electrical Nerve Stimulation (TENS) for symptomatic relief and management of chronic intractable pain; adjunctive treatment in the management of post-traumatic and post-surgical pain.